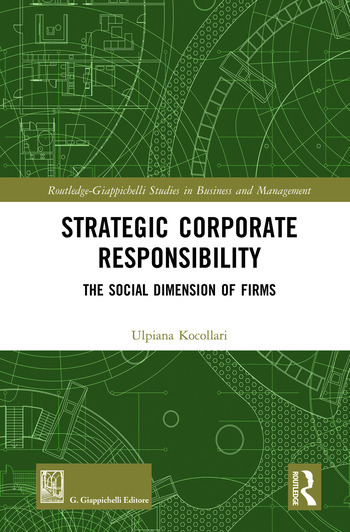 In her book, Dr Ulpiana Kocollari presents a unique contribution to the debate on Corporate Social Responsibility and Sustainability by clearly expressing how the configuration of a firm’s social dimension can help identify inclusive corporate governance models, define innovative management processes and reshape performance measurement systems for the evaluation and assessment of sustainable economic, social and environmental results. Moving a step further, a firm’s social dimension is defined within the configuration of stakeholders – resources – rewards patterns intrinsic to their interactions with their environment and embedded in their business activities. Based on this approach, a framework is provided to guide firms in identifying management activities grounded in and suited to their prevalent patterns, in order to support current and future strategies and establish adequate measurement and communication tools for pursuing their mission. The book contains original theoretical and empirical material and particular attention is paid to the principal social and environmental impact measurement models (i.e. Global Reporting Initiative, Social Return on Investments, Social Balanced Scorecard, etc. ), analysing their main features in order to pinpoint their adequacy in assessing the social dimension and to tailor their use more closely to the specific patterns to which they refer. Finally, a detailed application of the analysis framework, which the author has identified is proposed for Innovative Start-Ups with a Social Goal and for Benefit Corporations, in order to detect the patterns embedded in their social dimension and their distinctive traits, which influence their management and measurement processes. Ulpiana Kocollari, PhD, is an Assistant Professor in Accounting and Management, at the Department of Economics and Management Marco Biagi, University of Modena and Reggio Emilia, Italy.